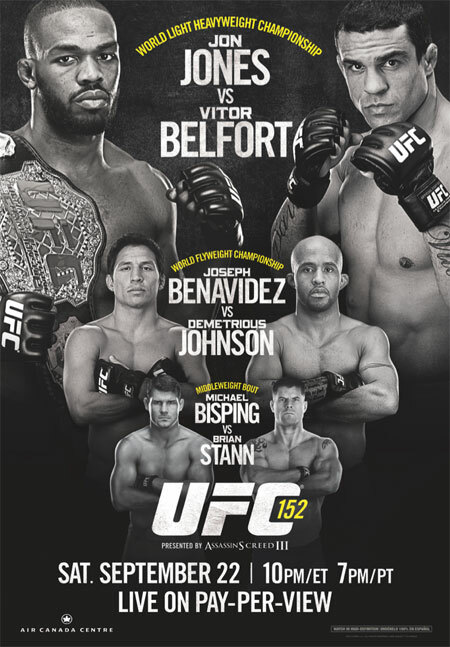 As the old adage goes, “Third time’s the charm.” The official event poster for UFC 152 has undergone several significant changes over the past week, and the Octagon’s graphics department hopes their cutting and pasting days for the September 22nd show are finally over. The flyweight finals between Joseph Benavidez and Demetrious Johnson was originally slotted to receive the card’s top billing. However, the planet’s premier mixed martial arts promotion opted to cancel UFC 151 after Dan Henderson got hurt – or because Jon Jones declined a last-minute scrap against Chael Sonnen, however you want to look at it – and the rematch with Jones and Lyoto Machida was pushed to headline UFC 152. Twelve hours later, Machida turned down the scrap because he felt one month wasn’t enough time to prepare for Jones, which opened the door for Vitor Belfort to step in. Abracadabra; UFC 152’s featured attraction is once again set. Air Canada Centre in Toronto hosts the festivities.